The adjustable speed limiter is a function to prevent the vehicle from being driven at a vehicle speed faster than a set speed. The vehicle speed is controlled to kept it below the set speed even if the accelerator pedal is depressed. The adjustable speed limiter can be set between 30 km/h (20 mph) and 200 km/h (125 mph). The vehicle speed may exceed the set speed when the vehicle is driven on a down slope, however, the system notifi es the driver by fl ashing the display and operating a warning sound. Always turn off the system when changing drivers: If the driver is changed and the new driver is unaware of the adjustable speed limiter function, the vehicle may not accelerate when the driver depresses the accelerator pedal, leading to an accident. The system consists of the adjustable speed limiter display and the speed limiter switch on the steering wheel. The setting status of the adjustable speed limiter is displayed in the active driving display or the display in the instrument cluster. 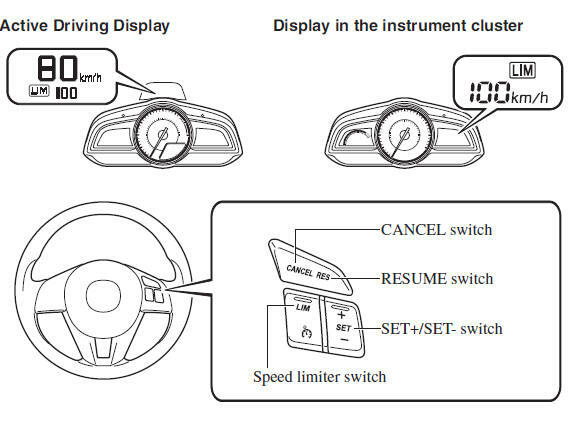 Displays when the speed limiter switch is operated and the system is turned on. Turns off when the system is turned off. Displays when the SET / SET switch is operated and the speed is set. Displays when any of the following operations is done and the system is temporarily cancelled. The indicator light illuminates amber when the speed limiter switch is pressed and the adjustable speed limiter is activated. The indicator light illuminates green when a speed has been set. If the vehicle speed exceeds the set speed by about 3 km/h (2 mph) or more, a warning sound operates continuously and the adjustable speed limiter display fl ashes at the same time. The warning sound operates and the display fl ashes until the vehicle speed decreases to the set speed or less. Verify the safety of the surrounding area and adjust the vehicle speed by applying the brakes. Additionally, keep a safe distance from the vehicles behind you. If the set speed is set lower than the current vehicle speed by pressing the SET or RESUME switch, the warning beep is not activated for about 30 seconds even if the vehicle speed is faster than the newly set speed by 3 km/h (2 mph). Be careful not to drive over the set speed. When the system is temporarily cancelled by depressing the accelerator pedal fully, the adjustable speed limiter display shows the cancel display. If the vehicle speed exceeds the set speed by about 3 km/h (2 mph) or more while the cancel display is displayed, the set speed display fl ashes but the warning sound is not operated. Press the speed limiter switch to turn the system on. The adjustable speed limiter display is displayed. To turn the system off, press the speed limiter switch while the adjustable speed limiter is displayed. The adjustable speed limiter display turns off. Always verify the safety of the surrounding area when setting the adjustable speed limiter: If the speed is set lower than the current vehicle speed, the vehicle speed is decreased to the set speed. Verify the safety of the surrounding area and keep a safe distance between vehicles ahead and behind you. Press the speed limiter switch to turn the system on. the current vehicle speed is 30 km/h (20 mph) or more, the speed is set to the current vehicle speed. When the current vehicle speed is less than 30 km/h (20 mph), the speed is set to 30 km/h (20 mph). the set speed decreases about 4 km/h (4 mph) by pressing the SET switch 4 times. The system does not operate when the cruise control is on. The system is temporarily cancelled when the vehicle is accelerated by depressing the accelerator pedal strongly, however, it resumes when the vehicle speed decreases to the set speed or less. The vehicle speed may exceed the set speed on a down slope. The system is temporarily cancelled (stand-by status) when any of the following operations is done while the adjustable speed limiter is displayed. Press the RESUME switch to resume the operation at the previous set speed. The adjustable speed limiter display remains displayed. The adjustable speed limiter is not cancelled by depressing the brake pedal.